Good morning, we are living in Nan and did buy some land where we are planning to build our house. Today the all design paperwork was all finished and I did read it all and saw some weird things in the technical department. 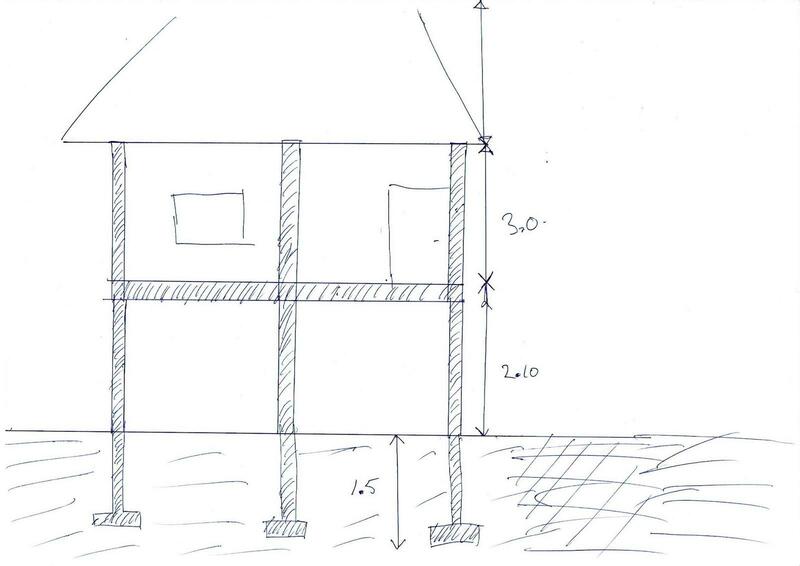 The house is going to be build on high poles, the top of the floor will be at +2.10m. So on top of that the house will be with a ceiling of 3.0m high and on top of that there will be a roof. The poles will have a big elephant foot in the ground, the end of the poles will be 1sqm each. The poles will go 1.5m into the ground. Basically we will not use the ground-floor besides of storage etc. But there will be a cement floor. But to my surprise the the poles are not connected at ground-level. So basically only at floor-level and at ceiling-level. But the latter will be a steel construction from the roof. I add a drawing as it would be. What do you guys think? It looks great. What colour will you paint it? And what will the roof be made of? Well maybe I did not expressed myself good but ..... what you guys / girls think of the fact that the poles go only 1.5m into the ground? I would think at least 2.0m. And what do you think of the fact that the poles are not connected at ground-level? (horizontal connection). Roof will be steel / aluminium frame with SCG titles. And 4 air-vents in the each corner. Any reason you cant go another 40 cm or so for that ground floor height? Whether you use it for storage or whatever, you still have to access it, a matter of centimeters only above you. All it needs is anything to raise that floor a little bit - a few planks, some tiles, anything stored and you can bet you will be cracking your head on the ceiling above. An extra length on a few support poles wont break the bank but it will stop you breaking your skull! Plus... you might change your mind in the future about that space and it might become living space. I am not a builder, this is not a DIY job but will be done by a construction company. The drawing I showed is my interpretation of the technical drawings made by the architect. But after almost 20 years living here I do know that some Thai have for no reason at all other technical standards as the rest of the world. Personally I think the poles should go at least 2m into the ground and personally I think the poles should be horizontal connected at ground level. Mind you the poles are basically about 3.5m long under the floor. But maybe I am overly concern. When I mentioned this the answer was "we not have earthquakes in Nan" and until now I think that is correct. But even without earthquakes soil can move. As of the low height of the floor (only +2.10m) it does not matter much for the length of my wife or me. Originally we wanted to make it only 80cm high, just for the air to flow under the house. Then we thought "make it a little bit higher so we have better view" but a little bit higher is really useless so we made in a height we can walk under it. I think that 'poles' should go as deep as they need to go. If they only go 1 metre and are structurally sound they're fine. If you are building on the Bangkok river delta, then they might have to go 3/4/5 metres deep. Also, the weight of the building dramatically affect footings. No idea why you would want to 'connect (the poles) at ground-level'? Re the concern over 'earthquakes'. 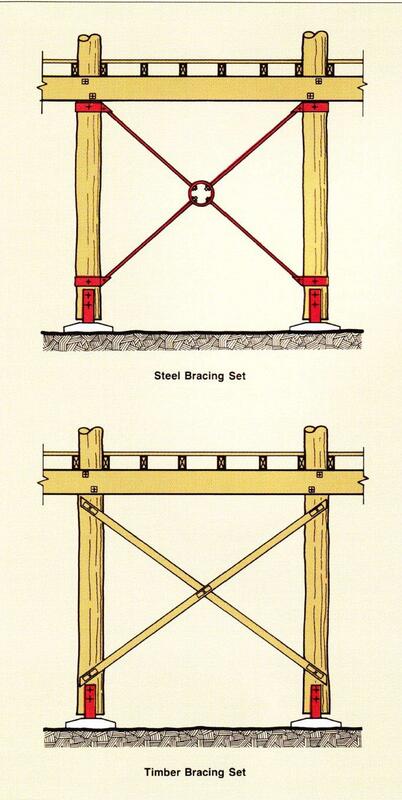 The most fundamental, cost effective technique you need is 'cross bracing' on the pole support. Below is for wooden poles, I don't know the technique for concrete posts supporting an elevated concrete slab.